Ubisoft even parodies the need to just “do” by including an alternate ending right at the outset of the game. By simply not doing anything when the game finally lets you have control of your character, Ajay finds a quick resolution, spoils a major plot point, and it is all that much more believable given the circumstances. Even Far Cry 3’s initial motivations in have the vacationing young adults captured and killed was more conceivable to see the main character join the conflict to rescue his friends and escape, no matter how campy. Ajay has no such impetus. For anyone that enjoyed Far Cry 3, they will find that loads of the content was airlifted straight from that island in the Pacific and dropped in the Himalayas. Do you recall burning the drug fields as Jason Brody? Ajay Ghale gets his own bout of drug farm destruction in this game, and one can’t help but feel all of the similarities when encountering parts like this. 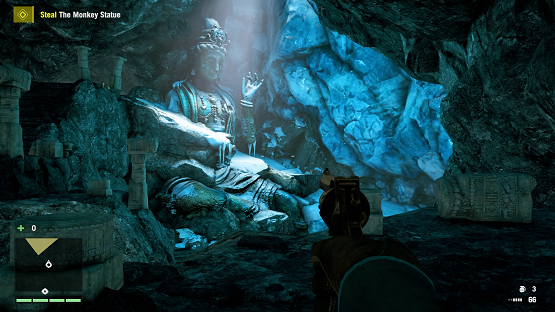 Far Cry 4 feels like a moderate advancement over Far Cry 3, and while much has remained the same, even down to many of the animations like skinning animals, there is enough that to make this a worthy successor and just as much of a fun game to play. Just don’t expect it to really feel like a whole new game. 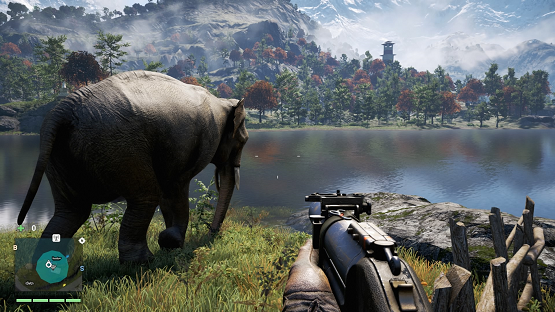 Far Cry 4 is like a massive Far Cry 3 expansion that looks incredible on the new generation of consoles, which isn’t a bad thing when Far Cry 3 was such a great game. There is no denying that Kyrat is beautiful, and the vertically focused Himalayan setting is fun to explore. The culturally inspired atmosphere captures the Indian setting elegantly, and every nook and cranny holds something, whether it’s loot, collectibles, or another mission. My gaming ADD got the better of me in far too many cases and I found myself bounding over mountains in search of animals to hunt, hidden masks and propaganda to destroy, and outposts to take over. The ups and downs of Kyrat are easily traversed using grapples for climbing and the wingsuit for rapidly getting down from high places. There are also a variety of vehicles from ATVs to a small personal helicopter that assist in getting around the map. Great care is taken to make sure that getting from one place to another never feels too mundane or boring, and likewise isn’t too easy and quick. There’s a good balance here, which is imperative in open world games. Progression through the game will find you unlocking additional skills and fun things to do in the environment like the arena competitions. These unlocks show a gradual progression system that neatly ties everything in Far Cry 4 together. Want to unlock that certain skill that lets you stealth take down heavy enemies? You’ll have to complete a particular side mission to have access to it. I loved this mechanic that makes every part of the game feel worthwhile, and leaves nothing feeling obtusely tacked on. One aspect I found lacking was the silly enemy AI. I found that the wildlife AI was much more interesting and a far greater threat that taking on Pagan Min’s goons. Ever tried to take on a fully grown Asian rhino with nothing but a bow? How about an entire streak of tigers or a colony of angry honey badgers? Oh, and then there’s the crocodiles, demon fish, not to mention the exotic versions of each animal that some missions have you hunting. As much fun as it is to land a long distance bow kill on an enemy, the second they discovered me it was as easy as pulling out my grenade launcher and wreaking explosive hell all over them as each one of them tried to predictably rush my position. The AI isn’t terrible, but it certainly isn’t imaginative either. Aside from the setting, there is one major feature of Far Cry 4 that outshines the third game, and that’s the online component. There is the competitive mode that pits the Royal Army against the Golden Path. This mode affords you nearly all of the luxuries of the single-player open world in an objective-based competitive setting. Then there is the much lauded co-op mode that has you and a friend roaming the open world of Kyrat together. This is amazingly fun, however, if you are the joining player, the only progress that saves is character progress such as experience and loot. You will need to redo all of the collectibles, outposts, and other map-based progression that you complete with a co-op buddy, and missions are locked off while playing cooperative. This feels like a bit of a slap in the face to the joining player, and discourages excessive cooperative play (sorry about that three hours of map progress lost for you, Dan! ), but it’s still worth it to have a friend flanking the opposite side of that particularly tough outpost. 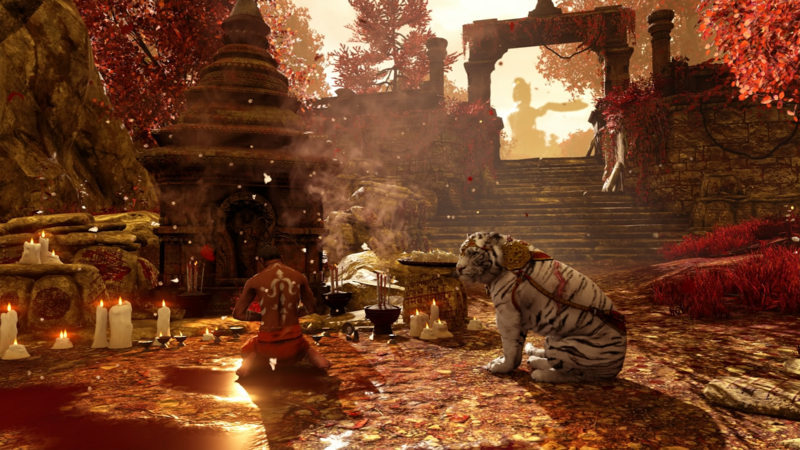 Far Cry 4 is a good game, but the lack of any real significant improvements or advancements over its predecessor may be enough to turn some people away. The major difference here is the Himalayan setting, which looks absolutely stunning and is a joy to explore using the Far Cry mechanics. The dearth of motivational integrity in the narrative aside, Far Cry 4 is a game that will have players losing hours of their lives as they get lost in Kyrat, either by themselves or with a friend. Far Cry 4 review copy provided by publisher. For information on scoring, please read our Review Policy here.